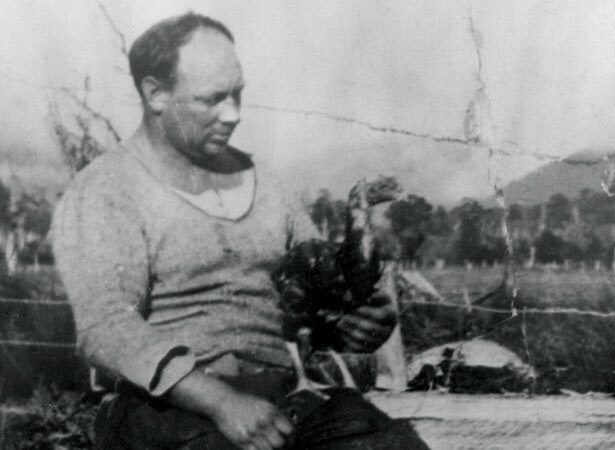 Dairy farmer Stanley Graham killed seven people in Kōwhitirangi on the South Island’s West Coast. One of New Zealand’s largest manhunts ended when Graham was shot on the evening of 20 October. He died of his wounds the following day. The tragedy began when Graham refused to hand over his rifle to police as part of the war effort. He felt that police were persecuting him rather than investigating his neighbours, whom he believed were poisoning his cows. On 8 October policemen Edward Best, Percy Tulloch, Frederick Jordan and William Cooper went to Kōwhitirangi after a neighbour claimed Graham had threatened him with a rifle. Cooper, Jordan and Tulloch were shot dead, while Best later died from his wounds. George Ridley, a visiting agricultural instructor, was also shot, eventually dying in 1943. Graham fled into the bush pursued by police, soldiers and home guardsmen. On the evening of 9 October, Graham exchanged shots with home guardsmen Richard Coulson and Gregory Hutchison. Coulson died immediately and Hutchison the following day. Graham eluded capture for 12 nights until fatally wounded by police. We have 3 biographies, 5 articles, related to Stan Graham's killing spree on West Coast.